Channel 4 Pinpoint Meteorologist Nancy Van Camp reported Sunday morning that the heavy snow will enter Southern Middle Tennessee around dinner time Sunday, with Nashville seeing serious snow late Sunday night through Monday. 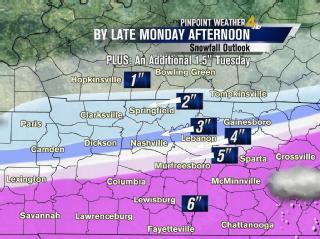 Parts of Southern Middle Tennessee could see six inches, with two-to-three inches forecast for Nashville. A friend of mine without transportation needs some staples (bread, milk, cheese, cereal) and I need some cat food to make my meatloaf (Hey Steve, want some??) (Hahaha… just kidding), so I’m picking her up to go on a grocery run. That is the point here. Check on your neighbor. Check with your friends. Do you know anyone who needs help in getting groceries? If you need help and don’t know anyone, please let us know here – you can email me if you’d like kathy (dot) tyson (at) comcast (dot) net – and we’ll find someone to come to your aid. Meanwhile who thinks there won’t be school on Monday and Tuesday? My kid's already planning to sleep 'til noon tomorrow. Thank the Lord she doesn't have to work – they don't take kindly to employees not showing up due to bad weather. Like I'm going to let her drive on slick roads all the way to Cool Springs (not!). holy crap, steve. be careful.